Ladakh, the mountainous region in the northwest Jammu and Kashmir is the largest and least populated region of the state. The population is a mix of Buddhist and Muslim, with the majority of Buddhists living close to the Chinese border and Muslims in the North-west. With its barren beauty, snow-capped peaks and clear blue sky, Ladakh has become a favourite destination among trekking, mountaineering and adventure enthusiasts. The population lives between altitude 2700m and 4500m in Ladakh. As Ladakh, the Little Tibet has Buddhist monasteries that were built centuries ago to attract global tourists; the region has a unique Buddhist lifestyle. The peace in monasteries, culture and lifestyle of inhabitants and ethnic diversity leave a deep impact on the heart of those who visit the region. 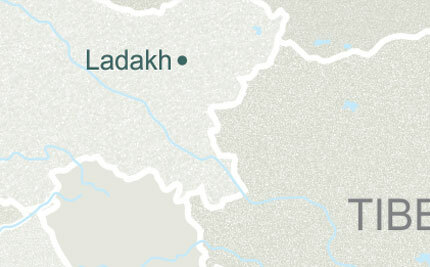 Leh, the Land of High Passes is the biggest town in Ladakh and is mostly inhibited by Tibetans. 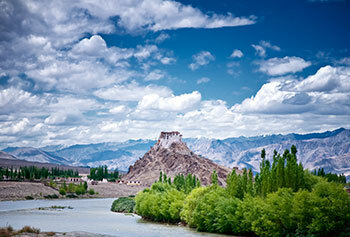 This is a very picturesque place and the best base for exploring Ladakh. One can find decent guest houses and restaurants here. Other towns & hamlets here are Alchi — a small village with a Buddhist monastery complex; Kargil — the areas for access to Zanskar area, and must see stop-over when travelling from Leh to Srinagar; Lamayuru — a quaint little village with a Buddhist gompa; and Shey — located near Leh, was the old capital of Ladakh. Ladakh has desert-type climate and dry wind blows throughout the day. 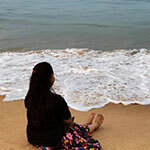 Summers are hot and one can get sunburn. Winters are chilling where temperature can dip too much below freezing point. Summer is the best time to visit the area as passes / cross over’s open for tourists. The intriguing lakes, mountain ranges and monasteries in Ladakh have allured travellers from far & near. The Tso Kar Lake, a high-altitude salt lake, is situated in Rupshy valley in Trans-Himalayan region. The white lake is surrounded by lush grasslands, salt flats and different other wetlands. Visit the lake in early morning, as the wetlands remain frozen and it is a sight to behold. Not to miss, the Tso Moriri Lake is the largest high-altitude lake in India at the height of 4522 meters. Two major springs and snow melts pour into the lake. The Tso Moriri Lake is also called as the Mountain Lake of India. As public transport is restricted to enter the lake area, travellers need two photocopies of their passport and visa. The permit is valid for seven days. 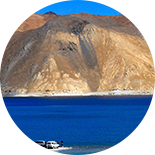 Yet another very popular lake is the Pangong Lake, is at a height of around 13,900 ft. 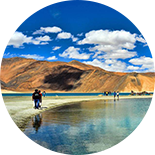 This star attraction of Ladakh is 134km long, extending to Tibet. The serene ambiance of the lake will leave you spellbound. Pangong Lake freezes in winter and its salt water doesn’t support aquatic life or vegetation. Walls of dramatic mountains lace up Ladakh and these mountain passes are dream destinations of adventure lovers. Numerous passes around this region, each more beautiful and more intruguing than the other create a mesmerising maze. 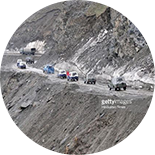 The Zojila Pass is located in the western section of Himalayan range on the NH 1D between Leh and Srinagar. The pass overlooks snow-capped mountains and dense forests. It is situated at an altitude of 3,528 meters. Another is the Baralacha La Pass, the highest mountain passes situated in the Zanskar region. It connects Zankar valley and Pir Panjal, the two prominent mountain ranges in the country. While the months from June to November are the best to visit the pass, it remains open in winters, even when there’s heavy snowfall. The Lachung La Pass is on the boundaries of Ladakh and Himachal Pradesh, located 54km from Sarchu. It offers mesmerizing view of snow-capped mountains. The pass remains open for four and a half months in summer season. 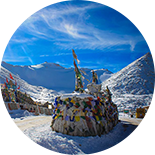 Not to be missed is the very famous Khardung La Pass, which is the gateway to Shyok and Nubra valleys. It is the world’s highest motorable road and offers some of the most magnificent views. You will see vibrant &colourful Tibetan / Buddhist prayer flags at different spots on the mountain pass. Land of Adventures, Ladakh is a must go for adventure lover, specifically those who love long drives in tough terrains and mountains. 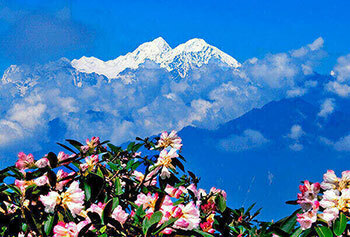 One can enjoy numerous activities such as mountaineering, trekking, river rafting and cycling. Zanskar River is ideal for river rafting as it has some difficult stretches. Those who love mountain biking must go to Karakoram and Zanskar mountain ranges. Camel safari is another unforgettable experience in Ladakh, and is quite popular in Hunder valley and Diskit. Numbra valley trek, Indus Valley trek, Chadar trek and Stok kangri trek are the popular terrains for trekking. The anti-gravity zone & the Moon land are not to be skipped, at all. Countless bodhisattvas, serene gompas, spinning prayer wheels and colourful prayer flags that share the mountain breeze create an aura of spiritual ecstasy in those mountains. Dotted with numerous monasteries you have many to visit. Some popular ones are Diskit monastery - Situated in Numbra valley. It is also known as Diskit Gompa, and is one of the largest and oldest monasteries. The 100 foot tall Buddha statue on the top is the main attraction of the monastery; Spituk monastery – It has many pre-historic idols, shrines, frescoes and religious scriptures. The monastery has about 100 monks and is a must-visit, especially for those who are Buddha devotees and history buffs; Shey monastery - Built on a hillock, approximately 15kms from Leh, this is one of the important Buddhist learning centres that was built in middle of the 17th century. The monastery has Tibetan artworks and manuscripts that captivate the imagination of Lord Buddha; The Hemis monastery - One of the largest monastic institutions in Ladakh, it familiarizes the visitors with teachings and practices of Mahayoga Tantra School. Thousands of tourists from many parts of the globe visit the monastery every year. As Ladakh is influenced by Tibetan and Buddhism, reflection of both the cultures is visible during festivals and fairs that are celebrated throughout the year. Some of the popular festivals celebrated here are Hemis festival, Ladakh festival and Losar celebration. These are the times when there is increase foot-fall of tourists. Food here is very simple and primarily depends on local produce. The Ladakhi cuisine is similar to Tibetan food with Thupka (noodle soup) being the most common one. Skyu, a heavy pasta dish prepared with root vegetables is the authentic Ladakhi food. Some of the preparations that one must try are - tsampa, cha ngarmo, and gurgur cha. Shoppers find their way even here, a locally handmade item such as caps, sweaters, socks and gloves are popular among tourists in Ladakh. Apart from these, one can buy stoles, Pashmina shawls, handwoven rugs and carpets. You will find ample collection of handicraft items such as Thangka paintings, prayer wheels and Buddhist masks in markets. Vegetation is sparse in Ladakh, except in wetlands, irrigated places, high slopes and streambeds. The fauna of the regions is similar to that of Tibetan plateau and Central Asia. Ladakh has total 225 species of birds of which hoopoe, robins, finches and redstarts are the most common ones found in the region. The blue sheep is the most found ungulate in the region. Other animals found are Asiatic ibex, Nyan, Chiru, Tibetan gazelle, Kiang, hares, pika and Tibetan sand fox. Local languages like Ladakhi & Tibetian are highly prevalent. Also, tourists need permit to visit some areas of Ladakh. 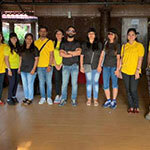 The Numbra Valley, Loma Bend, Tyakshi Tangyar, and Digger La, for example, need Indian tourists to show their valid photo ID at the army check-posts. Foreign tourists need to apply for Protect Area Permits in a group of two or more with the help of registered travel agents. While Indian tourists must provide their ID proof and nominal fee for the travelling area at least a day before the tour, foreign tourists have to provide a copy of valid passport and visa and fee for the respective travelling area, at least a day before the travel. Nevertheless, we will do all paper works in advance and our travel guides will be with our clients to assist you all through your holiday.